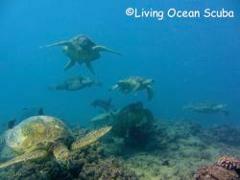 Our afternoon dives are the best place to swim with the endangered Hawaiian Green Sea Turtles. The sites that we dive are not deeper than 40-50 feet and make a great place for certified divers of all levels. 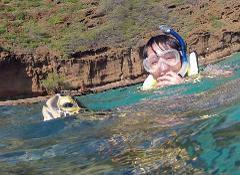 Our morning charters are great for certified divers that want to explore the most exciting wrecks and reefs around Oahu. 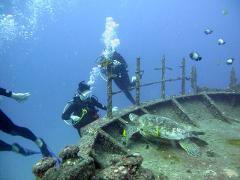 Dive famous wrecks such as the YO-257, San Pedro and the Korean fishing vessel "Sea Tiger" followed be an amazing reef. 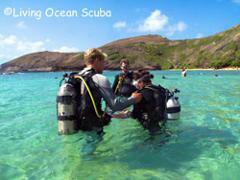 See the best reef areas in Hanauma Bay with a Hanauma Bay Dive Tours scuba instructor / guide. 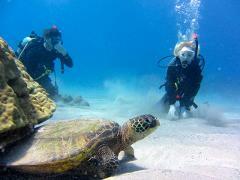 Our instructors will take you to see lots of turtles and schools of colorful tropical fish. No experience required. Great photo oportunities. 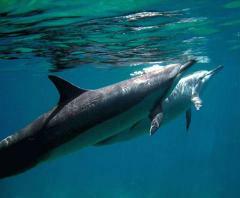 Swim with Hawaii Spinner Dolphins and Hawaii Green Sea Turtles on our Swim with Dolphins Adventure. Lots of beautiful colorful tropical fish and marine life. See whales in the winter time. Great photo opportunities. 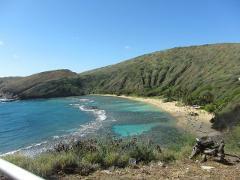 Come dive the outer reef at Hanauma Bay - Oahu's most famous nature preserve. This trip is available only to certified divers. One Tank Shore Dive. Option to go for a second dive for an additional $30.